In 1876, James Butler Hickok, better known as Wild Bill, was staying in the city of Deadwood, in what is now South Dakota. Wild Bill was a hero of the American Old West, gaining fame as a Civil War soldier, a scout, a marksman, and as a professional gambler. He was also famous for his work as a lawman and for being involved in quite a few shootouts. On August 1st, Hickok was playing poker at Nuttal & Mann's Saloon, against several other men, including buffalo hunter Jack McCall. McCall had lost all his money by the end of that day. At the end of the day, Hickok had given McCall enough money to pay for breakfast. The next day, on August 2nd, Hickok returned to the saloon for a drink. Hickok was invited to play in another game of poker, and Hickok accepted. Hickok, however, had a habit of sitting with his back against a wall so that nobody could sneak up behind him. The only empty seat at the table that day was the one with its back to the saloon door. Twice during the game, Hickok asked to switch seats, but both times, he was refused. While playing, Jack McCall walked in the saloon, and walked up behind Wild Bill. Hickock, unaware of McCall, continued playing. McCall drew his pistol and shot Hickok in the back of the head, killing him instantly. 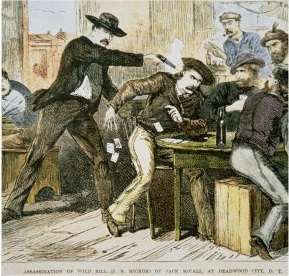 The motive for the murder is unknown, though many speculate that Hickok's donation of money to McCall might have been taken as condescending, though McCall claims that he was avenging his brother, who he claims was killed by Hickok, though there is no solid evidence for or against this claim. Wild Bill Hickok was buried in Deadwood, and almost the entire town attended the funeral. Hickok's murder only served to strengthen his own legend, and his many adventures became part of American folklore. When shot, Hickok was holding a pair of aces and a pare of eights, all black. The fifth card's identity has been debated. These four cards have been named "The Dead Man's Hand."